A legume is a type of dry fruit usually produced by plants in the family Fabaceae. Legumes can be a variety of fruits: peas and beans are types of legumes. Legumes grow from the carpel, the female reproductive part of a plant. The fruit of a legume is found inside a pod that can be split on both sides. 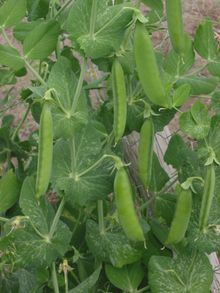 However, there are some foods that grow inside pods that are not legumes. Legumes contain many healthy nutrients, such as protein. They are a good source of protein for vegetarians and vegans, people who do not eat meat. They also contain fibre, which promotes a healthy digestive system. However, they contain some nutrients which humans struggle to digest. It is recommended that legumes are soaked before cooking to increase nutrient absorption. Some amino acids, such as methionine, are not abundant in some legumes but are needed to help the body use protein. The USA uses legumes for a variety of reasons, and is the highest producer. It uses soybeans to feed cattle and make vegetable oil. Peanuts are a popular snack food in the USA and these are also a type of legume. ↑ Sandberg, Ann-Sofie (2002). "Bioavailability of minerals in legumes". British Journal of Nutrition 88: Suppl. 3, S281–S285. doi:10.1079/BJN/2002718. http://journals.cambridge.org/download.php?file=%2FBJN%2FBJN88_S3%2FS000711450200257Xa.pdf&code=0af4a50bd3be34211339879b90c07d0c. Retrieved 22 February 2016. This page was last changed on 15 July 2016, at 22:43.